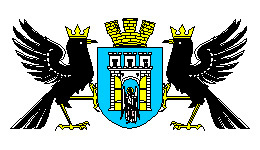 The capital city of Ivano-Frankivsk oblast. 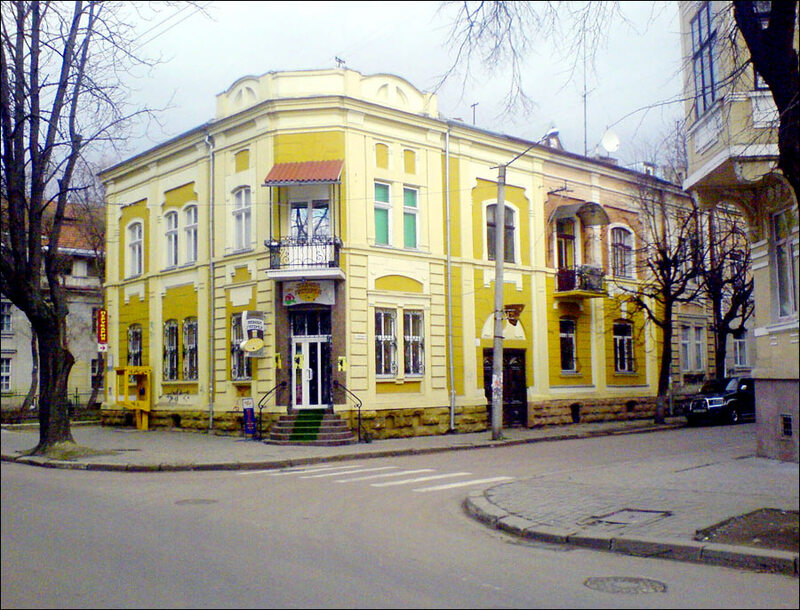 Ivano-Frankivsk (until 1939 - Stanislawow, in 1939-1962 - Stanislav) is a city and administrative center of the Ivano-Frankivsk region, an important economic and cultural center in the west of Ukraine. The population of Ivano-Frankivsk is about 229,000 (2016), the area - 120 sq. km. The phone code - +380 342, the postal codes - 76000-76030. Local time in Ivano-Frankivsk city is April 21, 5:30 pm (+2 UTC). Originally in the territory of the present city there were the villages of Zabolotya (mentioned in 1435) and Knyaginin (1449). In the middle of the 17th century, Stanislaw “Rewera” Potocki, a Polish noble, magnate and military leader, bought Zabolotya with the surrounding lands and used them for recreation and hunting. In 1650, his son - Andrzej Potocki - began the construction of wooden fortifications in this place. May 7, 1662, he founded a town and named it “Stanislawow” (in honor of his father or his son). 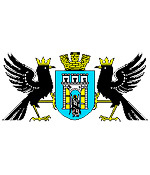 August 14, 1663, King John II Casimir formally approved the coat of arms of the town. In 1666, the town hall was completed. In 1672, the fortress was rebuilt in stone and the Potocki stone palace was finished. In 1772, as a result of the First partition of the Polish-Lithuanian Commonwealth, the town became part of the Austrian Empire. In 1801, because of the bankruptcy of Potocki, all his property was transferred to the state. The fortifications began to be dismantled and the materials were used for building purposes and paving roads. New streets were laid on the place of the buried ditches. In 1868, half of the town was destroyed as a result of a fire. In 1890, the population of Stanislawow was 22,391 people. In 1915, during the First World War, the Russian troops reached the town and heavy fighting greatly damaged it. In 1917, Stanislawow was occupied by the Russian troops. In early 1918, after the conclusion of the Brest Peace Treaty, the Austrian authorities returned to the town. In October 1918, as a result of the collapse of the Austro-Hungarian Empire, the West Ukrainian People’s Republic was formed. May 25, 1919, during the Polish-Ukrainian war, a Polish uprising took place in Stanislawow, then the Romanian troops entered the town, which remained there until August. In 1920, during the Polish-Soviet war, the town was briefly occupied by Soviet troops. In 1921, in accordance with the Treaty of Riga, Stanislawow became part of Poland. In 1925, it was decided to join Knyaginin to Stanislawow, as a result of which the area of the town doubled. According to the 1931 census, there were 198,359 residents in Stanislawow, of which Poles - 120,214 (60.6%), Ukrainians - 49,032 (24.7%), Jews - 26,996 (13.6%). September 1, 1939, the German troops attacked Poland, the Second World War began. September 17, 1939, the Red Army of the Soviet Union entered the territory of Poland, which later became part of the Ukrainian SSR. After the entry of Western Ukraine into the USSR, the city was renamed Stanislav and became one of the regional centers of the Ukrainian SSR. In 1940, Stanislav Teacher’s Institute was opened. June 22, 1941, the day of Germany’s attack on the USSR, the city was occupied by the Hungarian troops. October 12, 1941, about 8-12 thousand Jews were killed. By 1943, the number of Jews living in the city was reduced to about 11,000 people. February 23, 1943, they were killed, after which the city was declared “judenfrei” (“free of Jews”). July 27, 1944, Stanislav was liberated by Soviet troops. October 6, 1945, the Stanislav State Medical Institute was opened. October 31, 1945, a group of the Ukrainian Insurgent Army raided the area. In response, until February 1946, the troops of the NKVD (the People’s Commissariat for Internal Affairs) carried out a sweep of the nearby forests until the group was liquidated. 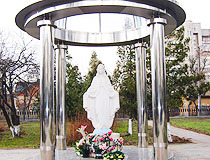 As a result of the exchange of population between Poland and the Ukrainian SSR, the Polish population of Stanislav was resettled in Opole, and people of Ukrainian nationality who had previously lived in Krynica-Zdroj moved to Stanislav. In 1959, the population of Stanislav was about 66,000 people. September 9, 1962, the city celebrated 300 years from the day of its foundation and was renamed Ivano-Frankivsk in honor of the Ukrainian poet and writer Ivan Franko who repeatedly visited it, wrote and read his works here. In 1971, the population reached 110,000 people. In the early 1990s, Ivano-Frankivsk was one of the centers of the movement for Ukrainian independence. Ivano-Frankivsk is a city with centuries-old history, long traditions, an extraordinary artistic life, and a dynamic economy. 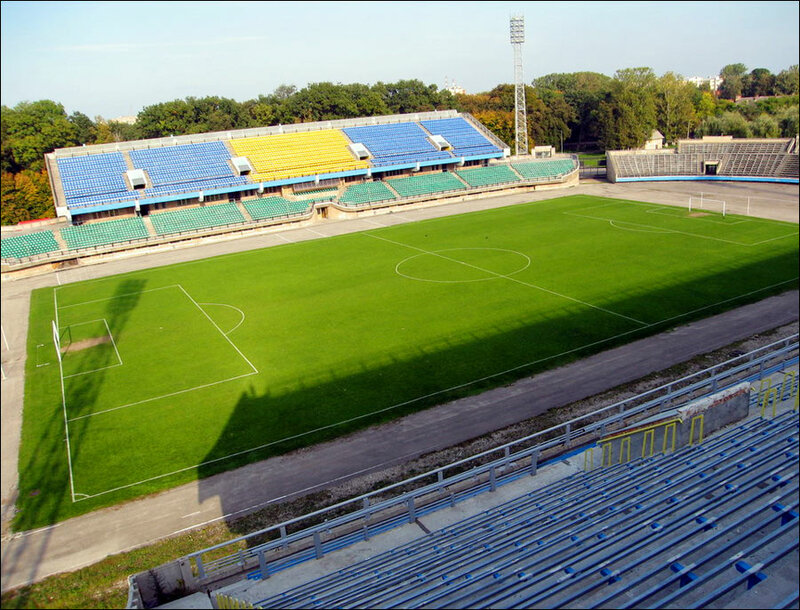 It is located in the south-west of Ukraine at a distance of 150-300 km from the borders of Poland, Romania, Hungary, Slovakia. The city is connected by a network of roads and railways with the countries of Europe and the former USSR. The international airport “Ivano-Frankivsk” carries out regular flights to Kyiv, Alicante (Spain), Valencia (Spain). The climate is moderately continental. The average temperature in January is minus 4.2 degrees Celsius, in July - plus 18.6 degrees Celsius. 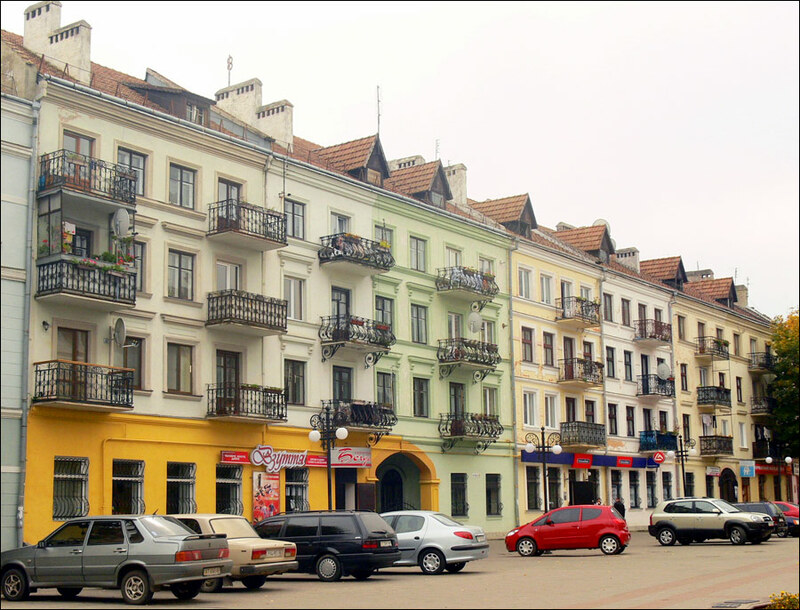 Ivano-Frankivsk is a significant center of machine-building, woodworking, chemical and light industries. Local enterprises are involved in economic activity with more than 80 countries of the world. 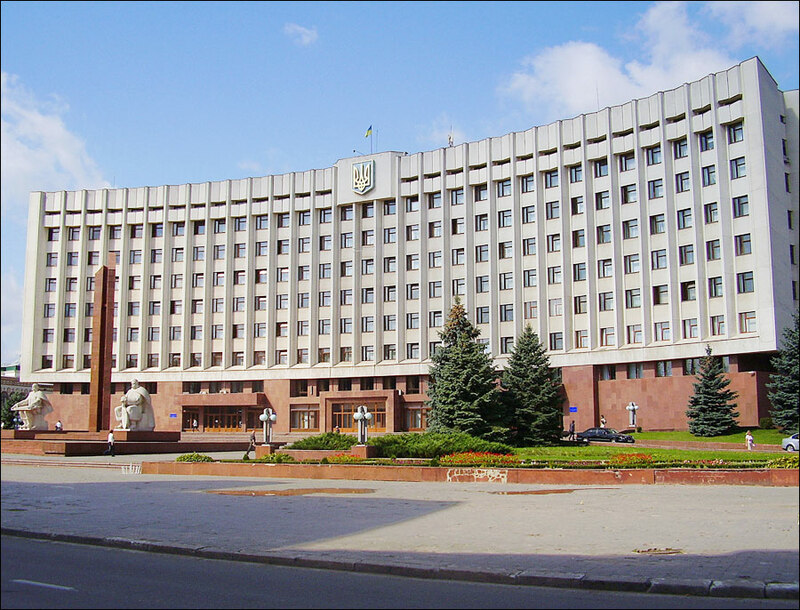 The name of the city is quite long and in everyday life it is called simply Frankivsk or just Franik. 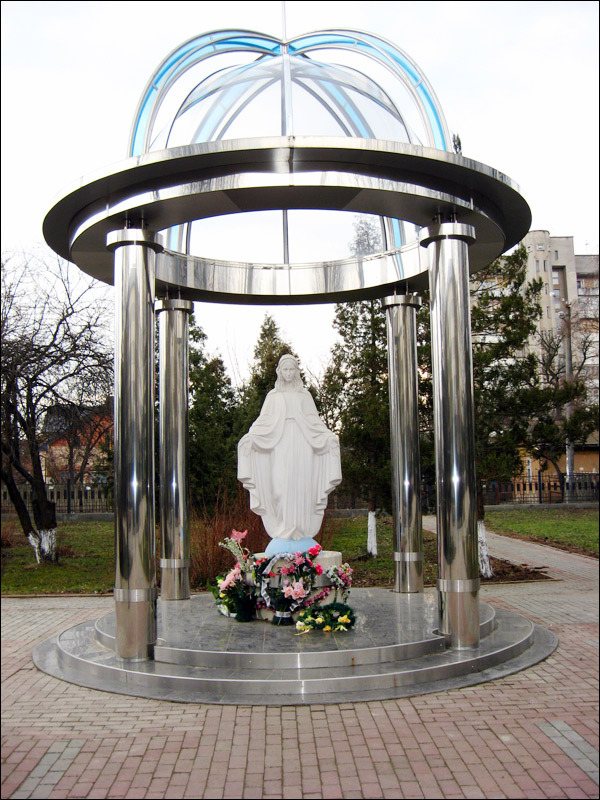 The City Day of Ivano-Frankivsk is celebrated in early May. Art Museum (Collegiate Church) (1672-1703). 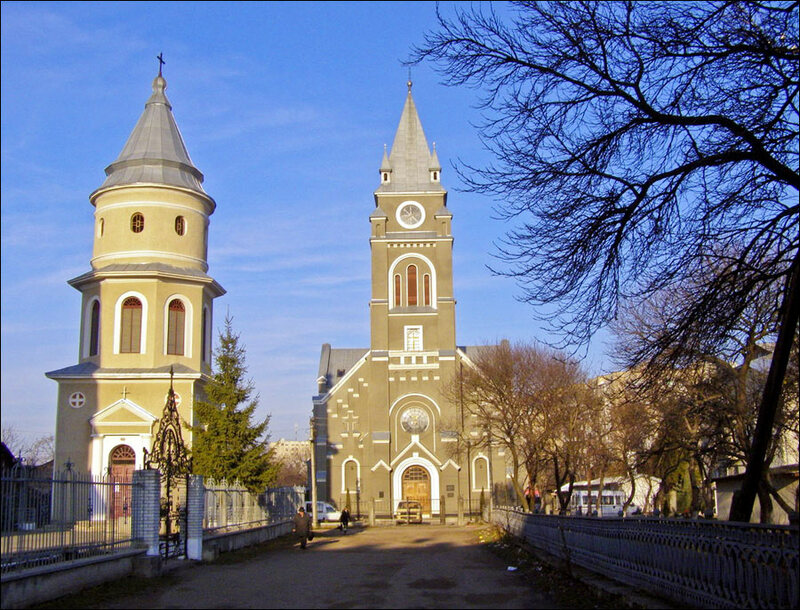 The former Catholic church of the Blessed Virgin Mary is one of the most valuable architectural and spiritual monuments of Ivano-Frankivsk. Here you can see examples of Galician icon painting, works of classics of Western Ukrainian painting, as well as works of Polish, Austrian, German, and Italian artists of the 18th-20th. Sheptytsky Square, 8. Opening hours: 10:00-17:00. Day off: Monday. Local History Museum (Town Hall) (1932). 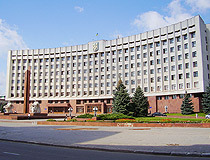 The constructivist building of the Town Hall on Rynok Square is the most recognizable symbol of Ivano-Frankivsk. The height of the building is 49.5 meters. The building houses several expositions of the local history museum: nature, history, folk art, archeology, rich collections of weapons and books, as well as antique furniture. In total, there are about 120,000 exhibits. Halyts’ka Street, 4A. Opening hours: 10:00-17:30. Day off: Monday. Museum of Family Professions. This private museum of professions was created by the journalist R. Fabrika. The exposition tells about 150 various professions the collector’s family has been engaged in over the last 200 years: beekeepers, architects, blacksmiths, doctors, builders, geologists, miners, musicians, agronomists, teachers, gardeners, etc. You can see various professional tools, devices, mechanisms, and apparatus. 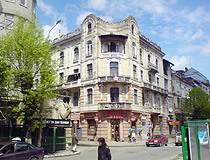 Kyivs’ka Street, 6A. Holy Resurrection Cathedral (1720-1763) - the main Greek Catholic church of Ivano-Frankivsk. The building of the cathedral belongs to the Austro-Bavarian architectural school with clear features of classicism. At the same time, the tops of the towers are made in the style of Hutsul wooden architecture. Sheptytsky Square, 22. Holy Protection Cathedral (1742-1762). 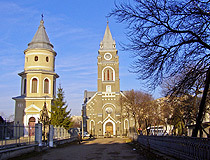 The Armenian church of the Immaculate Conception of the Blessed Virgin Mary is better known to the inhabitants of Ivano-Frankivsk as a “blue church”. This tall building with two towers, located near Rynok Square, was constructed in the Baroque style in the 18th century. The interiors were completely preserved in the Soviet times due to the fact that the building was used as a museum of the history of religion and atheism. Virmens’ka Street, 6. Church of Christ the King (1936-1938). The monastery of the Fathers of the Order of St. 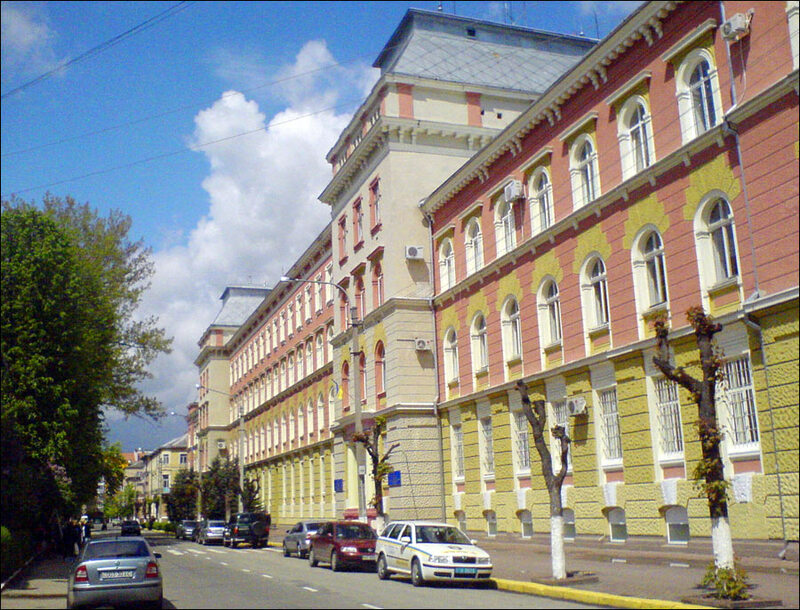 Basil the Great was founded in Ivano-Frankivsk before the Second World War. The Church of Christ the King with five domes was built in Byzantine style after the model of St. Sophia Cathedral. 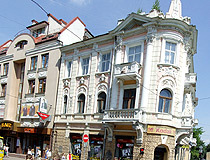 Nezalezhnosti Street, 181. Roman Catholic Church of Christ the King (1925-1939). There is an organ installed in the church. 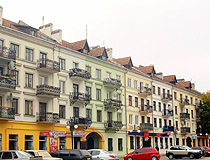 Vovchynetska Street, 92. Tsunami Water Park. One of the largest water parks in Ukraine with 6 pools and 12 water slides, jacuzzi, solarium, sauna, massage, fitness center. One of the pools (12.5 m deep) is designed for diving. In addition, the complex also includes an ice arena, restaurant and hotel. 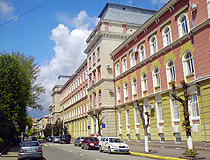 Oleksandra Dovzhenka Street, 29. Opening hours: 10:00-22:30 (Saturday, Sunday - 9:00). City Lake. Locals called this lake “Stanislav Sea”, when it appeared in 1955. 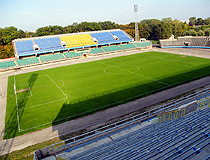 It is one of the main recreation areas of Ivano-Frankivsk. The most romantic place is the bridge leading to the “Island of Love.” Also there is a boat station. Mazepy Street. Shevchenko Park. The Park of Culture and Rest named after Taras Shevchenko was opened in Ivano-Frankivsk on the territory of the estate of Baron Romashkan in 1946. There are two ponds, an amusement park, several monuments on the territory of the park. Viacheslava Chornovola Street, 126. One Hundred Meters. “One hundred meters” or simply “hundred” (“sotka”) is the name of the pedestrian part of Nezalezhnosti Street. Its real length is about 500 meters. 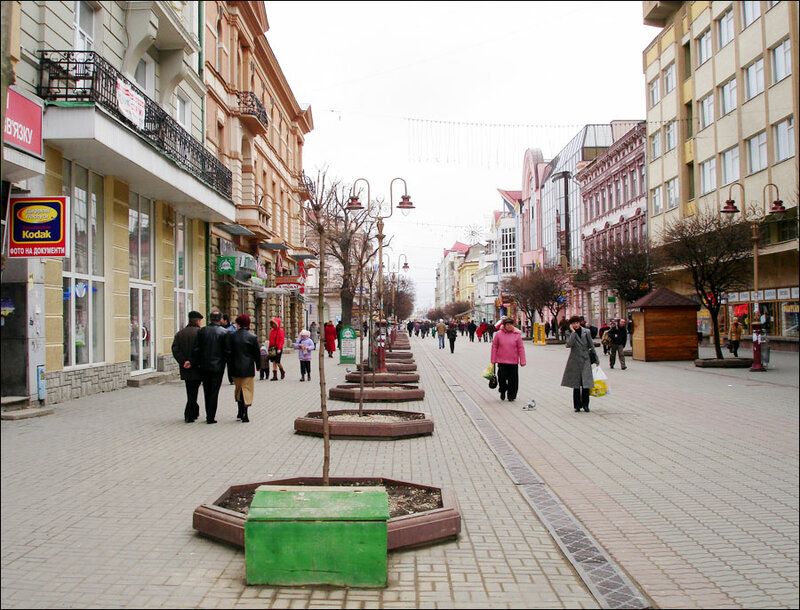 This is the most popular walking area of Ivano-Frankivsk with a lot of street cafes and restaurants, bookstores and boutiques. Every year new forged sculptures are placed on this street and the streets located nearby. Bastion. This fragment of the defensive wall with the bastion is all that remains of the old fortifications of the fortress of Stanislawow in present-day Ivano-Frankivsk. Today, in the casemates of the restored bastion you can find the gallery “Bastion” - a shopping and entertainment complex with a terrace for walking, souvenir shops, boutiques, cafes, and a restaurant. There is an exhibition of sculptures, paintings and photographs. Fortechnyi Lane, 1. Potocki Palace. This fortified palace-castle was founded by the founder of the town in 1672. Unfortunately, the only well-preserved part is only the palace fence with the entrance gates decorated with knightly symbols. 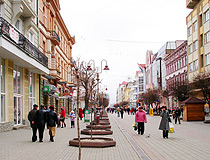 Shpytal’na Street, 3. Ivan Franko National Academic Music and Drama Theater. Nezalezhnosti Street, 42. In total, there are about two dozen different hotels in Ivano-Frankivsk. The following English friendly hotels located in the central part of the city offer the best level of service according to visitors’ reviews. 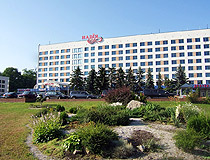 Hotel “Nadiya”. 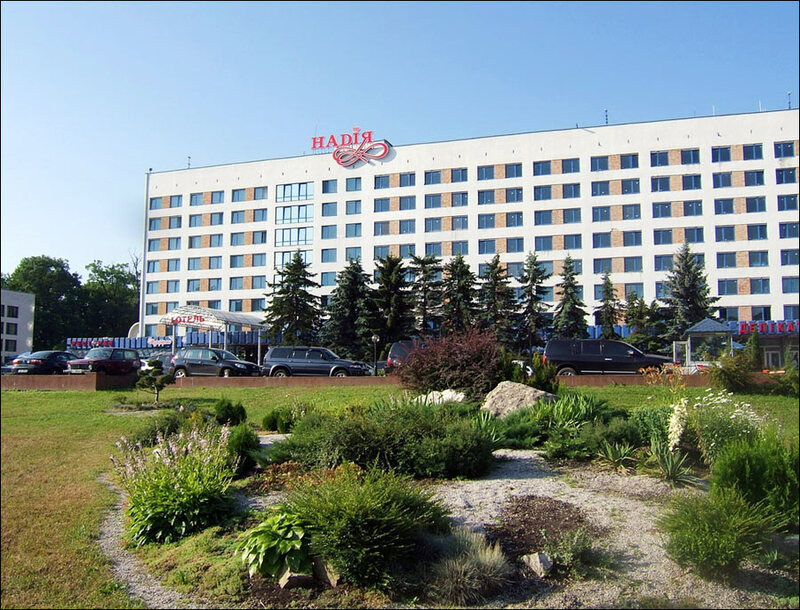 The largest hotel in Ivano-Frankivsk (244 rooms), it is located in the central part of the city, 5-minute walk from the central square. Air conditioning, free Wi-Fi, parking, non-smoking rooms, bar, ATM, pets are allowed, excursions, shuttle service, car rental. There is a restaurant (European and Ukrainian cuisine). Nezalezhnosti Street, 40. Phone: +380 342 727 077. Hotel “Atrium” - a modern hotel located in the historical center of Ivano-Frankivsk, 2-minute walk from Rynok Square. 11 comfortable rooms with air conditioning, free Wi-Fi and parking, non-smoking rooms, ATM, bar, restaurant, pets are allowed. Halyts’ka Street, 31. Phone: +380 342 557 879. 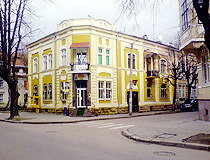 Hotel “Stanislaviv”. It is a new modern hotel located about 500 meters from the center of Ivano-Frankivsk. 21 hotel rooms are located on the 5th and 6th floors of the building. Air conditioning, free Wi-Fi and parking, family rooms, pets are not allowed, the staff also speaks Polish. Viacheslava Chornovola Street, 7. Phone: +380 342 752 470. Hotel “Pid Templem”. 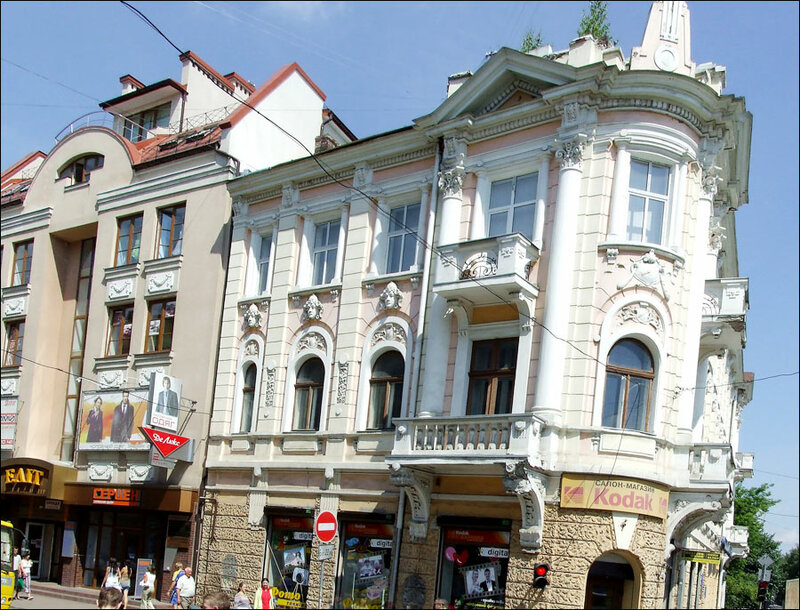 This modern hotel-museum is located in the heart of the historical part of Ivano-Frankivsk, near the monument of architecture - the Tempel synagogue. 11 non-smoking rooms with air conditioning, free Wi-Fi and parking, bar, restaurant, pets are not allowed, gift shop. There is a room for people with disabilities. The lobby bar “Tsymes” offers dishes of kosher ethnic Jewish cuisine. Strachenykh Ukrainskykh Natsionalistiv Street, 7A. Phone: +380 342 595 333. Hotel “Reikartz Park Hotel”. The hotel is located in a picturesque quiet place of Ivano-Frankivsk, near the lake - one of the best places to relax in the city. It takes about 10 minutes to get to the city center by car. 38 double rooms of different categories with air conditioning, free Wi-Fi and parking, family rooms, shuttle service, pets are allowed, bike rental, sauna. The restaurant “Alpine Meadow” offers dishes of European and Ukrainian cuisine. The grill-bar “Ranch” - European and American cuisine. Het’mana Mazepy Street, 146. Phone: +380 342 595 595. Sergio asks: What events in Ivano-Frankvisk do you recommend me to visit on April 8 to 17, 2016? I have found the following list of cultural events taking place in Ivano-Frankivsk (day by day). Closer to the time of your trip, go to this page and you'll find a lot of information on upcoming events. You can use this service to translate the site from Ukrainian.